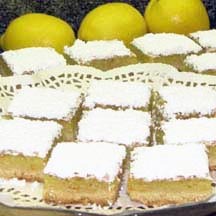 Classic lemon bars with a tender, shortbread crust topped with a luscious, sweet-tart lemon filling and sprinkled with powdered sugar. For Crust: Preheat oven to 350°F (175°C)*. Lightly grease the sides only of a 13x9x2-inch baking pan and set aside. In a bowl, stir together the flour, powdered sugar and softened butter until well combined. Press crust mixture firmly and evenly onto the bottom of prepared baking pan. Bake for 15 to 20 minutes or until lightly browned. For Lemon Filling: In a mixing bowl, beat together the sugar, flour, baking powder, salt, eggs and lemon juice until well combined, about 2 to 3 minutes. Pour mixture over the hot crust. Bake for 25 to 30 minutes or until filling is set. Cool completely on a wire rack. Sprinkle with powdered sugar and cut into bars. *If using a dark-colored baking pan, reduce the oven temperature to 325°F (160°C). Nutritional Information Per Serving (1/24 of recipe): 201.3 calories; 37% calories from fat; 8.6g total fat; 55.6mg cholesterol; 76.2mg sodium; 27.2mg potassium; 29.5g carbohydrates; 0.3g fiber; 20.9g sugar; 29.1g net carbs; 2.3g protein.